Things might be on a bit of a hiatus for the next little while. My trusty Sony Xperia Z5 Compact literally went up in flames a few hours ago, and I need to find a replacement very soon, as well as recover any data that wasn’t saved to my SD card. Thankfully, apart from a sore throat and burning eyes from battery smoke, I am doing fine (as well as my house). My Sony Xperia Z5 Compact… after the lithium-ion battery fire. Once things settle down, I’ll hopefully have a juicy story about lithium-ion battery fires and (failed) eMMC data recovery. Cookie Clicker saves: You don’t realize the importance of saving your progress until you lose your save data. A few days ago I opened Chrome to my always-running instances of Cookie Clicker, but found that all of my progress was deleted (and it was showing a “Don’t forget to back up your save” message just to add insult to injury). 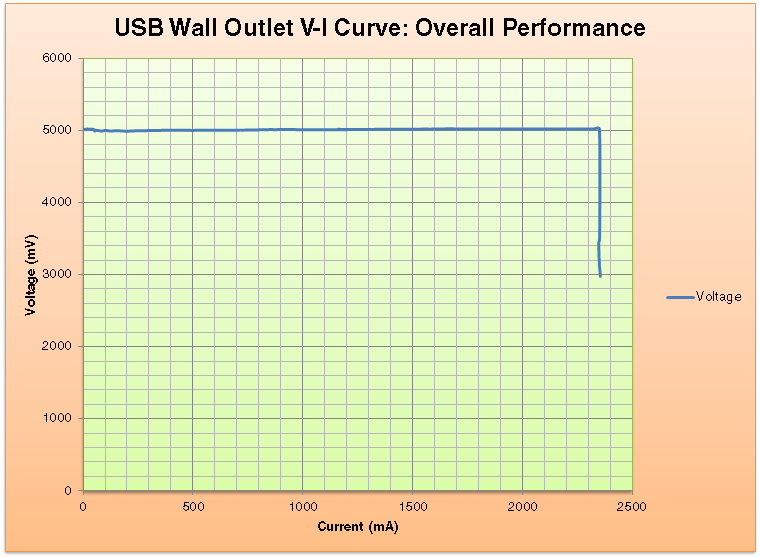 There’s been word going around that Samsung’s 840 EVO solid-state drives have an issue where they become really, really slow to read if the data on it has been sitting around for a few months, and I can confirm this is the case as well. 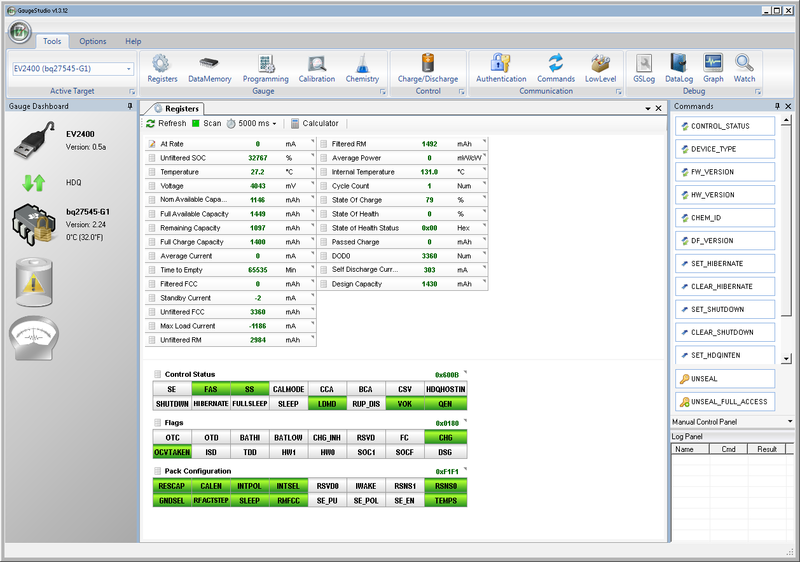 Hard Disk Sentinel reading out data. Dark green squares indicate slow data transfer. Graph of read speeds on the SSD. The first half of the drive (which holds a fair amount of static data) was being read at around 30 MB/s, with newer data being read at almost 500 MB/s. That’s a pretty big difference. One thing to note (I didn’t take a screenshot for this) is that although the overall read speed was significantly affected, the read latency was only somewhat slower; only about 10-20 microseconds of extra latency. 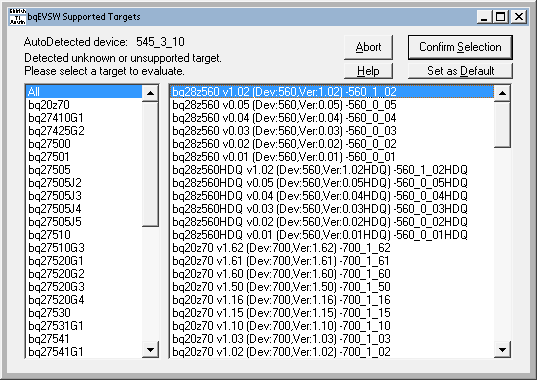 To temporarily fix this (at least until Samsung releases a firmware update in the middle of October), I used Hard Disk Sentinel to read and rewrite all of the data on the SSD. Because this involves accessing data that is normally locked by Windows, I made a custom WinPE (a slimmed-down, portable version of Windows that’s used for installation and recovery) image with Hard Disk Sentinel inside it. 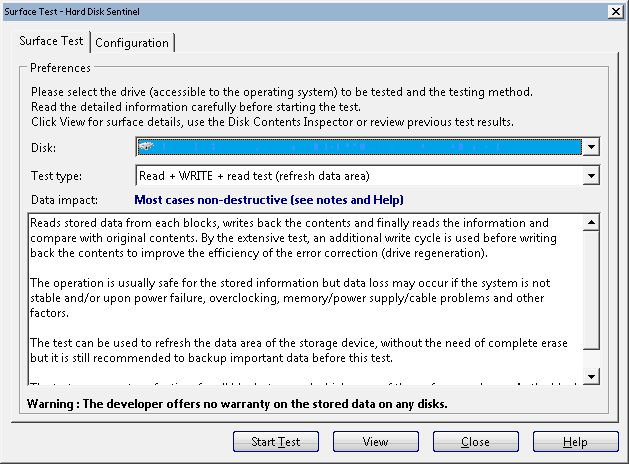 This allowed me to boot outside of the normal Windows setup, and perform the Read+Write+Read test to refresh all of the data stored on the SSD. 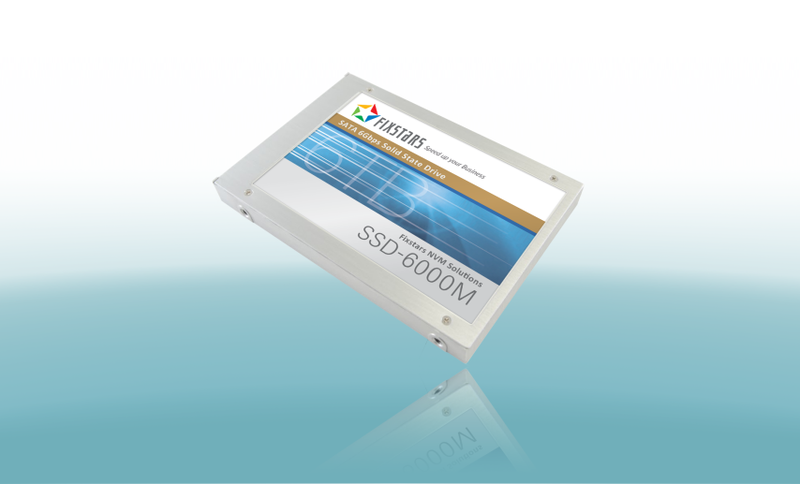 Note that this will impart a lot of write activity to the NAND flash in the SSD (hence a chance for increasing wear), but modern SSDs aren’t as delicate as people might think. This took about 2 hours on my 250 GB SSD. Afterwards, another read test showed that the drive was working smoothly again. 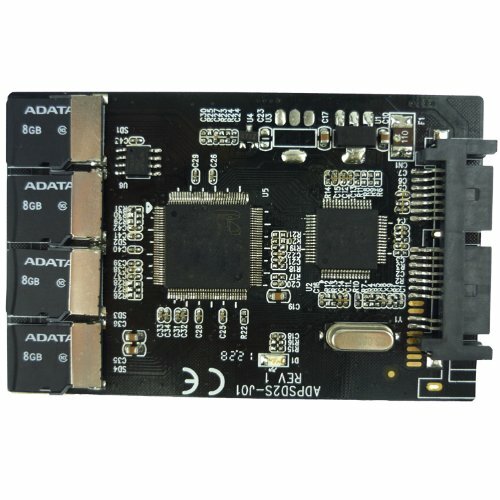 Will I still buy a Samsung SSD? Absolutely. No data was lost and Samsung did the right thing by acknowledging the issue and also finding a way to fix it, as opposed to simply calling it a non-issue and sweeping it under the rug. Considering how popular the iPhone is, there’s always going to be some counterfeits out there. I’ve been out buying various iPhone batteries to build a database of each generation’s characteristics, but one model has eluded me so far: the iPhone 5S. The iPhone 5C’s battery that I bought appears to be genuine (but with its own issues), but none of the iPhone 5S batteries I’ve bought so far (4 of them at the time of writing this blog post) were genuine. All of these fakes look like a genuine battery at first glance, but all of them share a few common traits. The fake battery sports the usual iPhone battery information, complete with some dot-matrix printed data and a data-matrix barcode. It’s labeled with a capacity of 1560 mAh and 3.8 volts nominal voltage. The connector itself has two points for soldering the connector to provide durability. However, with the fake batteries, they are not soldered down. The two spots on the ends of the connectors are dark with a small point visible inside it (that point is the reinforcement pin on the connector). If this connector is installed in an iPhone, it will probably not come out without either damaging the battery’s connector, or worse, leave the plastic connector piece inside the phone, requiring tweezers to remove. 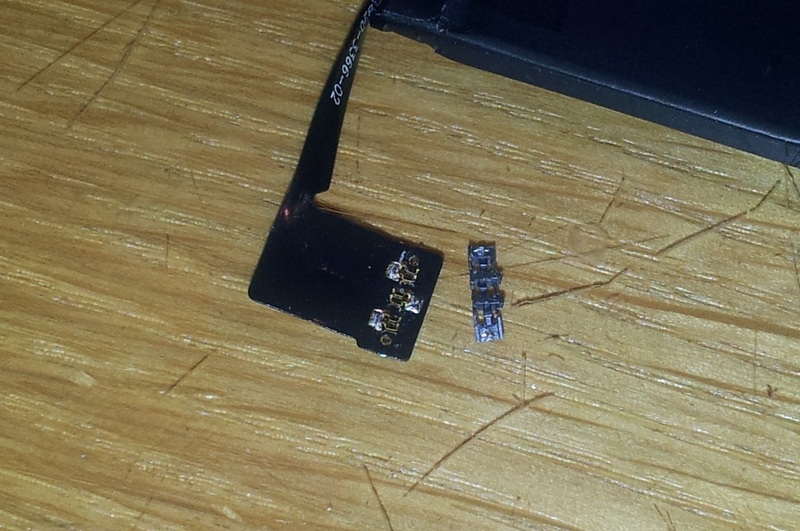 Removing the black protective tape reveals an iPhone 4 battery fuel gauge board. The connector is soldered to this board, with four solder points visible. Pulling out the PCB reveals another characteristic of these fake batteries: the positive terminal is cut short, with another metal section being clumsily spot-welded to the stub on the cell. 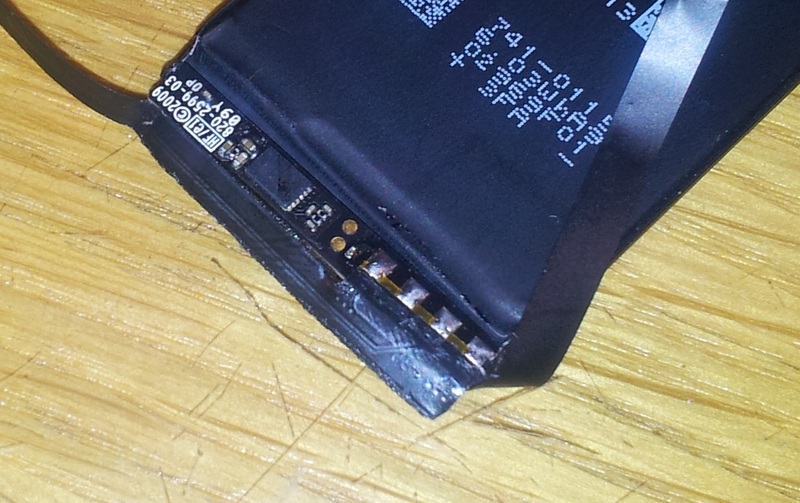 Note how the battery tab is poorly welded to the PCB. The battery fuel gauge requires proper programming to accurately indicate the battery’s charge status. Because of this, each iPhone battery generation has its own specific configuration. The fake iPhone battery retains the programming for the iPhone 4’s battery, which is a designed capacity of 1420 mAh, using a bq27541 fuel gauge running version 1.25 firmware. The data inside it is often that of a used/recycled battery as well. This data can be (partially) read out directly from the iPhone with a tool such as iBackupBot, but more data can be read if the battery is read with another tool. I have the EV2400 from Texas Instruments to read this out on a PC, but this data can be read out with a USB-to-TTL serial port, a logic gate (a logic inverter) and a small MOSFET transistor. I created a small tool that uses this circuit to interface with the fuel gauge and read out its data. Check it out here. Using my tool, this is the report for one of these fake batteries. Note how it is identified as an iPhone 4 battery. Don’t be fooled by the calculated state of health. It’s not accurate for this battery as the fuel gauge still thinks it’s still inside an iPhone 4 battery pack. Battery's configuration matches that of a standard iPhone 4 battery. Ramble: Engineers and hackers – never the twain shall meet? Note: This is a vent post more than anything, and as such it won’t have much relation to the other things I write. If you want to stick to my main content, feel free to skip this blog post. In the wake of my previous teardowns of the iPhone 4 and 4S batteries, I went onto eBay and Amazon (realizing that they finally have Amazon Prime student rates up in Canada) and bought a few iPhone 5 and 5S batteries. Although I was primarily interested in trying to get the gas gauge information out of the batteries, I had a secondary reason. The Nexxtech Slim Power Bank (a subject of a separate blog post) uses a pair of 3.8-volt Li-ion polymer batteries, and they seemed to be be suspiciously similar in size to what is used in the iPhone 5. But enough of that, we’re here for the iPhone 5 battery in particular! The iPhone 5 battery measures 3.7 mm in thickness, 3.2 cm in width and 9.1 cm in length. This particular model, made by Sony, has a model ID of US373291H, with the six digits corresponding to the cell’s dimensions. This cell has a labeled capacity of 1440 mAh at a nominal 3.8 volts, with a maximum charge voltage of 4.3 volts. I tried to read the data matrix barcode on the cell but my barcode scanning app on my phone refused to recognize it. I might try to scan and sharpen the barcode later but it’s not something that’s of a high priority to me. The board itself is rather interesting. The protection MOSFETs used to switch the battery’s power are chip-scale packages and are glued down with epoxy, same with the gas gauge itself. This means that I can’t easily replace it with a rework station if the need arises. The board includes the gas gauge, thermistors, protection circuitry and still has room for a polyfuse for extra over-current protection. The pinout of the iPhone 5 battery is pretty much the same as of the iPhone 4 and 4S. You have Pack-, NTC Thermistor, HDQ and Pack+. 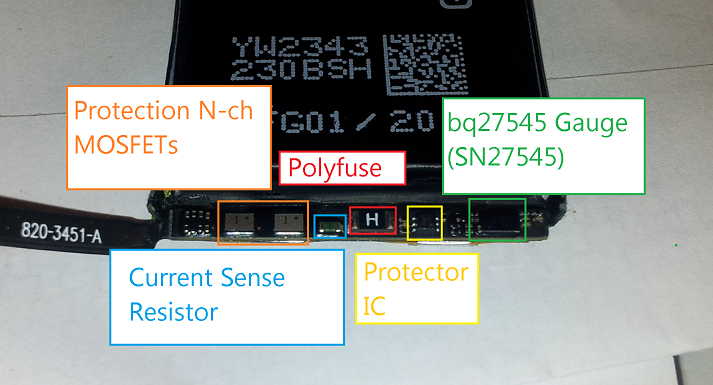 In this particular model of battery, the gas gauge is a bq27545 (labeled SN27545), but has basically the same feature set as the iPhone 4/4S’ bq27541. With this information, I soldered to the small terminals on the connector (the actual connectors for this battery haven’t arrived yet since it takes so long to receive items from China on eBay), and hooked it up to my trusty Texas Instruments EV2400 box. Nope. No dice with 0x36720414, unlike last time. … and I get the dreaded “Unseal Key” prompt. Cue the dramatic Darth Vader “NOOOOO” here. Maybe Apple read my previous post and decided to change the default keys this time (Hey Apple, if you read this, make the iPhone 6’s gas gauge have the default keys again)! This means that not only can I not access any of the juicy details of this battery, but I cannot update its firmware to a more… conventional version either. I could try brute-forcing it, but trying to hack a key with a 32-bit address space over a 7 kbps bus… uh, no. That’s not going to happen. I’d probably have better luck reverse-engineering Apple’s battery code but I doubt they have any facility to do in-system firmware updates for the gas gauge. Now for some rather… interesting details of what we can access. The design capacity of this battery, according to the gas gauge, is 1430 mAh, same as the iPhone 4S and also 100 mAh less than what’s written on the label. That, and the full charge capacity of this battery is 1397 mAh out of the gate. The gauge seems to be an insomniac (it won’t enter Sleep mode even when the battery is not hooked up to any load), and it seems to have less features despite having a higher firmware version (I’m sure the internal temperature isn’t 131 degrees C…), and the Pack Configuration register doesn’t bring up any sensible data. One thing that I haven’t confirmed is whether or not this battery had been tampered with before I received it. I bought this particular battery from eBay and it was listed as new. It had some adhesive residue but no obvious sign of being peeled off from another iPhone. The cycle count is set to 1, and because the gas gauge is sealed, I can’t read any other data like the lifetime data logs. There is a chance that this battery isn’t new and that the seller had somehow changed the data memory and sealed the chip with a non-default key, but I need to wait until some other batteries arrive in the mail and perhaps try reading out batteries taken out directly from some iPhone 5s. Until then, it’s only speculation as to why this chip is sealed with a different key. The next victims specimens: an iPhone 5S battery, a “new” iPhone 4 battery, and an Amazon Kindle battery. Back in late 2011 I purchased a set of 44 6″ by 6″ monocrystalline solar cells (the good stuff) off eBay. These cells sat unused for years until I tried to build a small panel with one of the cells. I wanted to have a small portable panel that I could bring around to charge my phone (I shoehorned a Nokia BL-5C into my Samsung Galaxy S II and it still works better than my fake “Samsung” battery I bought off eBay for $7 or so). 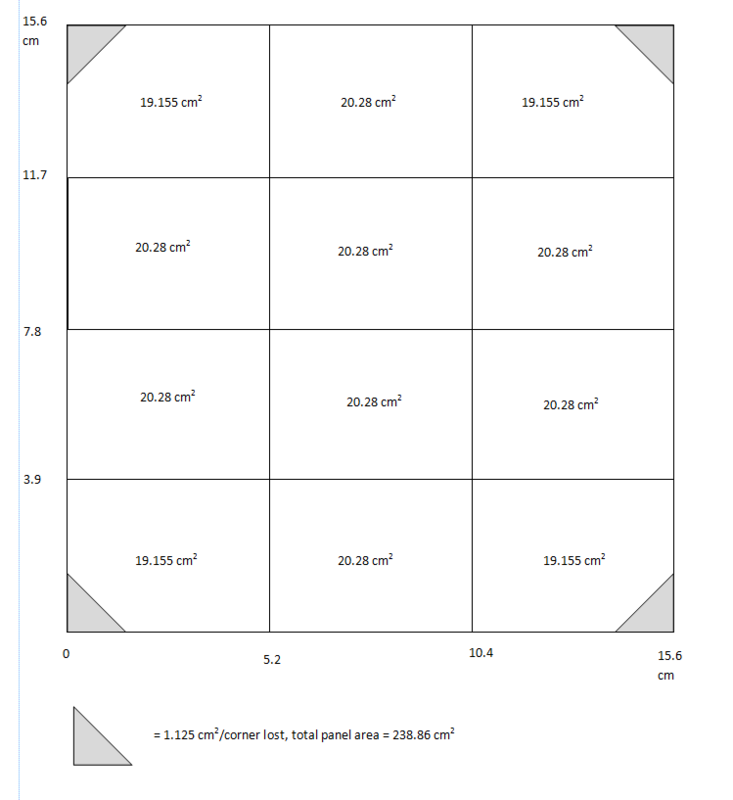 I created a layout of the way to cut up the cells using Microsoft Publisher, as it has the ability to create shapes in a what-you-see-is-what-you-get manner. I divided the 6-by-6 inch cell into 12 subcells. One whole cell is rated for 4 watts in full sun (0.5 volts * 8 amps), so each subcell should produce ~667 mA or 333 mW. However, the corner cells will have 1.5 cm^2 less area because monocrystalline cells are manufactured from a round wafer, but the output difference isn’t of huge concern to me. Of course, the useful power output of the cells will be much lower than this, but designing for that’s all part of the fun (or pain, depending on how you look at things). I used a diamond cutting disk designed for a Dremel or other rotary tool, and scored the top side of the solar cell. If things went as planned, I could “snap” the cell at that scored line and it should break cleanly. Since at this point the cell was basically ruined (Most of the fragments are usuable, provided the silver conductive pad is present on the back of the cell), I decided to cut up some “usable” sections by scoring both sides (and with more depth). It worked… okay I guess. The yield was poor but I did have a few cells that split acceptably. The second attempt worked… okay…ish? Third attempt went a little better. Subsequent ones… not so much. Overall, the panel’s usable area is much less than what I expected. With 12 subcells I can expect about 1-2.5 watts from this panel. Oh well, live and learn. 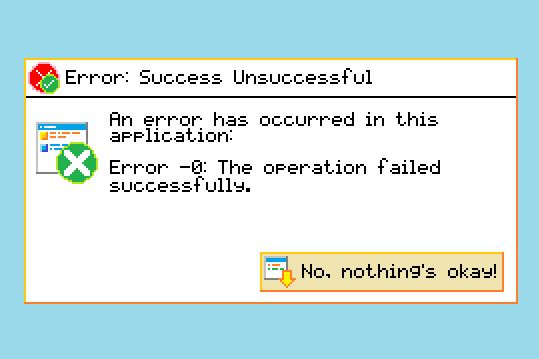 I’ve created a new category for my posts, named “The Operation Failed Successfully” in a somewhat mocking term of the Windows error “The operation completed successfully.” It’s intended to be used in a similar manner as Hack A Day’s “Fail of the Week”, showcasing some… less successful ideas of mine.